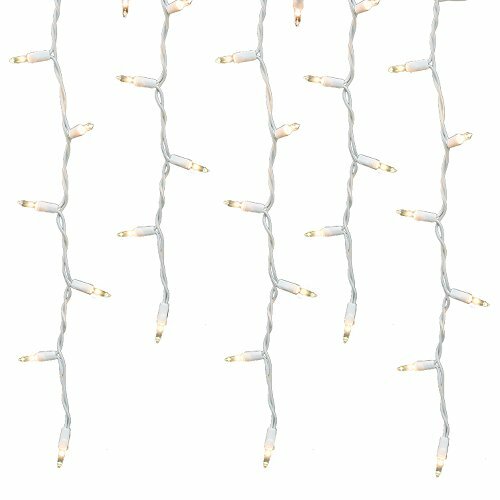 Holiday Essence 100 Icicle Lights, Clear Bulbs, Professional Grade for Indoor & Outdoor Use, Soft Bright White Bulbs with White Wire, UL listed. ✔ Helps you decorate your place and yourself without depending on anyone. ✔ Comes with 100 clear light bulbs with white icicle strings. ✔ You can connect multiple strings together up to 5 string lights. ✔ Ideal for occasions like Christmas, to decorate your House, Windows, Drapes etc. ✔ Garden Party, Patio Decoration or even to decorate your outside and fences. ✔ Steady Burning mode for a brighter shine. ✔ Even you lose one bulb the others remain burning. ✔ 7 feet strings with 6 feet lighting length. ✔ Comes with spare bulbs and fuse. ✔ Ideal for both Indoor and Outdoor. INDOOR/OUTDOOR Safe for Indoor and Outdoors Use! Safety Fuse - Can connect multiple light strings, A maximum of 45 of these light strings can safely be connected. If you have any questions about this product by Holiday Essence, contact us by completing and submitting the form below. If you are looking for a specif part number, please include it with your message.